JAMM Art Gallery is pleased to announce Shahrzad Ghaffari’s first solo exhibition in Dubai. 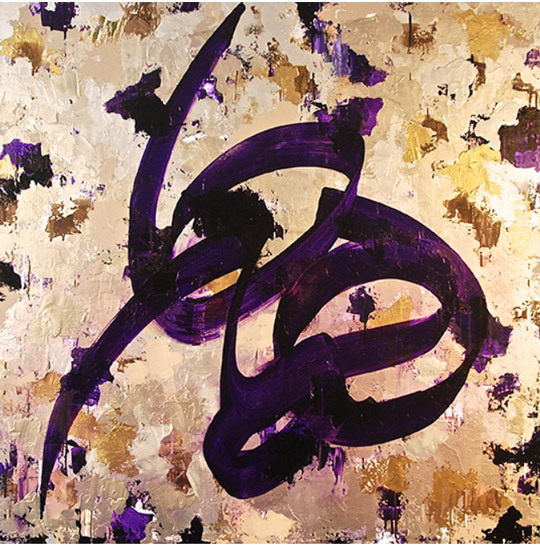 Influenced by the Persian literature and calligraphy, Ghaffari has skilfully turned language and poem into form and composition. She creates a new form of expression that profoundly connects to Persian roots and culture and sweeps new vibrant power through classic meaning. The artist combines daring colours and stripes on canvas and creates a primal energy, relief and triumph as the painting seduces the viewer to stand witness to the blissful flight of the soul. Through the instant and mesmerising appeal of her work, the viewer can enter the world of enlightenment and spiritual ecstasy. Each unique experience is at once personal and universal. Shahrzad Ghaffari, was born in Tehran in 1972. As a member of the Ghaffari family, who has nurtured many renowned Iranian masters such as Sani-ol-Molk and Kamal-ol-Molk Ghaffari, Shahrzad continues a family tradition that spans more than 150 years. Ghaffari studied graphic design at the Faculty of Arts at Tehran Azad University and has held solo exhibitions in London, Paris and Tehran.